After Ebola - What Happens Next? Monrovia — As Sierra Leone deals with a certain level of public fear after the discovery of a new strain of Ebola virus in the northern part of the country, Liberia's public health authority tells Liberians that there should be "no cause for alarm". The new strain of Ebola named 'Bombali virus' was discovered in fruits eating bats and has the potential to infect humans, researchers say. Scientists say they "have a lot of work to do to really understand if it is a pathogen and whether it does or doesn't pose a threat" that might lead to an outbreak. Authorities in Sierra Leone announced the new discovery on Thursday as a means of preempting negative rumors and have started rolling out education programs to reduce potential spillover, reports British newspaper, the Express. In Liberia, the National Public Health Institute (NPHIL) setup to by the government to research, monitor and prevent infectious diseases, says there's no need to alarm over the situation happening across the west of its country's borders. "There is no need to panic about this situation; researchers are in control. It is not a new outbreak as it is being considered by people," says Tolbert Nyenswah, NPHIL's Director General. "The facts are, it can be transferred to human cells but what is not known is whether or not it can cause the [Ebola] disease as in the case of previous outbreaks," he told FrontPage Africa on Wednesday. There has been no human-to-human transfer of the new strain as in the case of the 'Zaire strain' which infected thousands of people leading to the deaths over 11,300 people in Liberia, Guinea and Sierra Leone. Nyenswah, however, added that what is unknown about the new strain is whether it is virulent like the Zaire strain; adding, "This is why scientists are working overnight to determine". "So, what we need to be caution about is playing with fruits bats or eating them. These kinds of things are very much warned against especially in the region of Sierra Leone that we are talking about," he said. 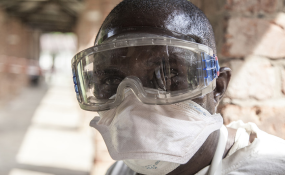 Can Liberia Prevent an Outbreak? While disclosing that similar research is on-going in Liberia to investigate viruses in animals, Nyenswah stressed that Ebola is always a cause for concern like any other infectious disease that disrupts human population and socioeconomic activities like cross border trade. But he is relying on Liberian experts' "lessons learned from the 2014-15 outbreaks" to put the country in a better position to deal with any potential threat. "Those measures that we need to take right now as a country, Liberia is taking them right now and that there's no outbreak," he said. However, he refused to rule out potential outbreak, but expressed confidence in the capacity of NPHIL to prevent, detect, and respond timely to potential outbreak in the country. NPHIL's surveillance, early warning and detection and laboratory systems are in place to curb any outbreak, he said, while recalling that "the world new little about the Ebola virus when it hit back in 2014". Before the 2014 West Africa outbreak, Ebola was last discovered in 1976 in Zaire (now DR Congo) with few sporadic cases in remote areas, and health experts say it made it difficult to rely on early research. But the outbreak in urban cities of West Africa widened scientific research about the virus, something that has made public health experts like Nyenswah even more knowledgeable about dealing with potential outbreak. "So there was lot of lessons that we learned that have informed the entire world," he said, referencing the successes in dealing with flare-ups after the country was declared Ebola-free. The use of trial vaccines - although not approved yet - based on informed consent, also help intervened in some of those incidents, while lots of "the Liberian experiences" were emulated to also help roll back the recent outbreak in the DR Congo, the NPHIL boss said. "So the world now is well equipped, we are well on top of the game now, we are ahead of the curve to deal with Ebola situation," he said. At the same time, the NPHIL says it is working to refute rumors and speculations about the outbreak in Sierra Leone here in the country and continued to use county health offices to explain the nature of the new Ebola strain as a means of averting the spread of misinformation. It is also working closely with its counterparts in Sierra Leone to ascertain the on-the-ground situation including reactions from the population. Meanwhile, there has been no report of an Ebola outbreak in the entire West African region but late Wednesday evening, the WHO announced four new cases in DR Congo.